These ingenious little 'chips" double as a healthy side dish and a kid-friendly guilty pleasure. Because they are baked, not fried, and include a trifecta of delicious root vegetables, they are a healthy alternative to their traditional greasy cousins. If your kids are begging for French fries (as mine often do), why not just give them what they want. Try Chef Nicole's recipe for Sweet Potato, Yukon Gold, & Carrot Chips. Watch Chef Nicole's step-by-step video for this great recipe. 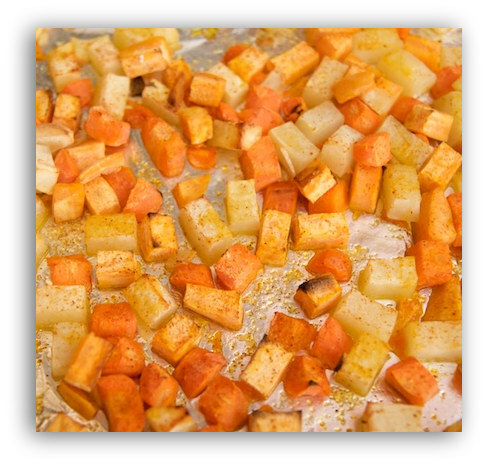 Place vegetables onto a Silpat lined cookie sheet and drizzle with olive oil, Adobo and ground black pepper. Toss to coat and bake for 10 minutes, turn once, and continue baking for another 10 minutes. Potatoes will be crisp and golden brown.